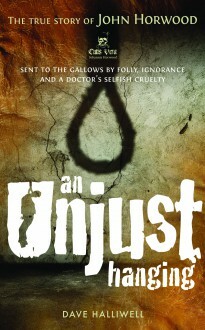 An Unjust Hanging begins one winter’s evening in 1821, stung by his girlfriend Eliza’s rejection, 17-year-old John Horwood picked up a stone and flung it at her. That thoughtless act of fury was to cost both these young people their lives. A prominent surgeon who clearly placed his own reputation above the care of his patients carried out an operation on Eliza which he must have known would probably kill her – as it did. Smith kept her skull for teaching purposes, and when John was sentenced to hang for her death he made sure the youth’s body would be his to dismember. He even had a book bound with John Horwood’s skin. When Mary Halliwell, a descendant of John Horwood, unearthed this grotesque and shocking story, she and her husband Dave went into action. 190 years after the fateful day when John’s young life was so unjustly snuffed out, they finally managed to arrange a Christian burial for his remains.